Mapping basically allows users connected on a particular network to have access over the shared computer. The data placed in the network drive is secured and users need security authorizations for accessing that. A Company’s database might be stored through a network, allowing specific users to access their own folder in which a specific data is kept. The network drives are also useful in college campuses where the data of students and faculties are stored in their separate folder. They need permission or security authorization in order to access that. It is also to be noted that the administrator may modify the users having the access to a particular directory. Network drives are separate for each user account. It is only accessible from that user account, from which it was made . Or in other words, it is not available for those having user accounts on the same device. They can be referred to as hard drives , denoted by names/letters/numbers followed by directory locations , which are separated by ” \ ” symbol. Open the “File Explorer”. Go to This PC. 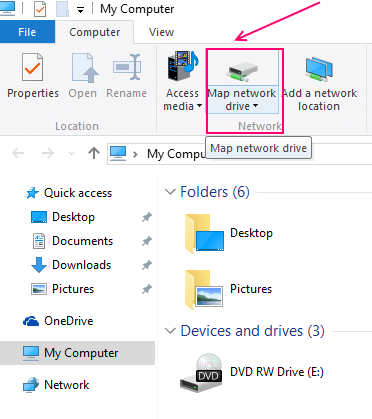 You’ll find Map network drive option at the top below the Computer tab. This is the ribbon Menu. After clicking on that, a dialog box appears . Provide the letter, which you want to have for your drive. Browse for the folder which you want to map. You can also provide the address of the directory in the box directly without browsing. The folder needs to be shared in order to map it. You can check it by right clicking the folder and selecting the Properties. Under this , you will find the Advanced Sharing option under the Sharing tab. After clicking Advanced Sharing, a new box appears, where you need to ensure whether “Share this Folder” option is elected or not. If not, then select it and click OK.
After that, ensure that the Reconnect at sign-in option is checked. If not, do so. This enables automatic connection of this network when you sign in the next time on this PC. 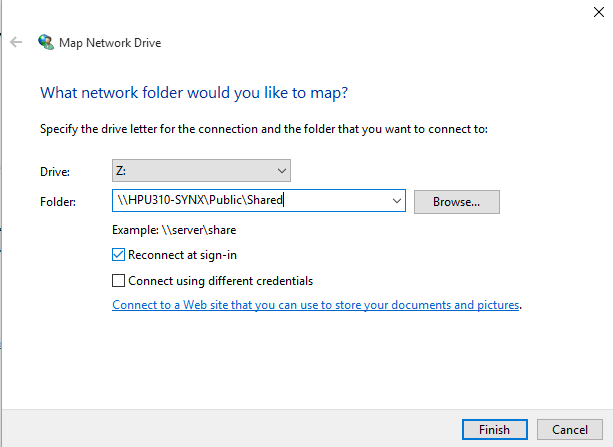 Note- If you are trying to connect to a shared folder , not available on your computer, you will have to check the box “Connect using different credentials”. Here you can enter your login details, which includes your user name and password. Contact the network admin, if you don’t have login credentials. Now, in the Network Locations, check whether your chosen network is showing up or not. The x mark on the drive indicates unavailability. In that case, check your network connections. If you want to disable this connection, you may right click, and then click on the Disconnect option. Thus, now you can easily get your shared files from this network drive. It exactly works out like your hard drive, from where you can read and write files by accessing that particular drive. Note that – When you are having connections like LAN or WAN , the host computer needs to be online in to order to ensure the availability of network mapped drives. Now we think, Network Mapping is easier for you. Isn’t it?